NEW YORK -- Craig Sager, the longtime NBA sideline reporter famous for his flashy suits and probing questions, has died after a batter with cancer, Turner Sports announced Thursday. He was 65. "Craig Sager was a beloved member of the Turner family for more than three decades and he has been a true inspiration to all of us," Turner President David Levy said in a statement. "There will never be another Craig Sager. His incredible talent, tireless work ethic and commitment to his craft took him all over the world covering sports." Levy's statement did not say when or where Sager died. Sager, who worked basketball games for TNT for nearly a quarter-century, revealed in March 2016 that his leukemia was no longer in remission. He said doctors told him the typical prognosis was three to six months to live, but "I am receiving the best treatment in the world and I remain fully confident I will win this battle." Sager first announced in April 2014 that he had been diagnosed with leukemia, and he missed the playoffs and much of the following season as he underwent two bone marrow transplants. His battle with cancer brought out the soft side of Gregg Popovich, the prickly San Antonio Spurs coach with whom he had many memorable exchanges during in-game interviews. Sager sported suits in every color of the rainbow and plenty of shades not found in nature, from teal to fuchsia to magenta. He would match plaid blazers with paisley ties or striped shirts - all in bold hues. Kevin Garnett once told him to burn an entire outfit. In a 2016 interview with HBO's "Real Sports," Sager recalled how Popovich reproached him for trying to stand out. Sager explained to him: "Coach, you don't understand. If I'm not wearing bright colors and if I don't feel lively, it's not me." Sometimes lost in the glare of his wardrobe was Sager's relentless nature as a reporter. Every time Popovich would give a terse non-answer, an unfazed Sager would pepper him with another question. During the 2016 NBA All-Star Weekend, Popovich described Sager as "an iconic figure in the NBA." "He does a great job," the coach added. "His sense of humor is obvious. We have a lot of fun going back and forth with that." Sager's persistence was on display at the start of his career, when the 22-year-old found himself in the middle of one of the most famous moments in sports history. Making $95 a week in 1974 as the news director at WSPB - a Braves-affiliated AM radio station in Sarasota, Florida - Sager risked getting fired by deciding to hop a flight to Atlanta for a game with Hank Aaron a home run away from breaking Babe Ruth's career record. With a last-minute credential, Sager was stuck in the third-base photographers' well. As the historic homer sailed out of the park, Sager, without thinking, sprinted onto the field and wound up chasing Aaron down the third-base line. When Aaron's teammates mobbed him at home plate, Sager can be seen in his trench coat in the middle of the scrum. The next day, Sager caught a 5 a.m. flight to Sarasota to be back in time for his morning drive responsibilities, and his tapes from the game wound up in Cooperstown. During his career, Sager would work as a reporter on the Olympics, Major League Baseball playoffs, NFL and NCAA Tournament, among other sports. But he was indelibly connected to the NBA. His popularity around the sport was evident as he went through the cancer treatments. Sager got to cover his first NBA Finals in 2016 through an unusual arrangement between TNT and ESPN, which invited him to join its coverage. He marked the occasion by wearing a blazer with a royal blue floral print. In an interview with LeBron James after Game 6, the Cavaliers star turned the tables to giddily ask Sager a question: "How in the hell do you go 30-plus years without getting a finals game?" Bulls star Dwyane Wade also sold paisley ties during the 2016 playoffs to raise money to combat blood cancers. Earlier that season, Sager called the support he received from Commissioner Adam Silver, coaches, players and fans "humbling." "It's been very uplifting, very therapeutic," he said. "I try to get there three hours before the game, talk with the ushers and the security guards, the coaches and the fans," Sager said in 2015. A native of Batavia, Illinois, Sager attended Northwestern, where walked onto the football and basketball teams and served as the school's "Willie the Wildcat" mascot for three years. He worked at several TV and radio stations in Florida after college before spending two years in Kansas City. Sager joined CNN in 1981 after handling the network's first live remote report during the 1980 baseball playoffs. 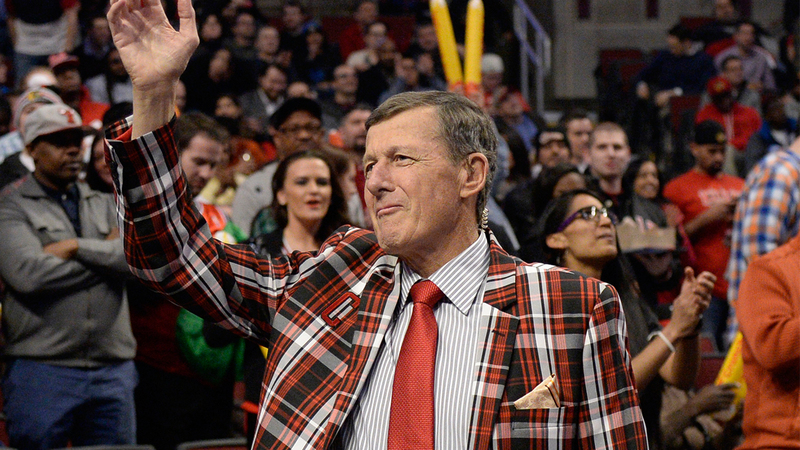 Sager was in Dallas for a game in April 2014 when he felt ill and sought treatment from Mavericks team physician Dr. Tarek O. Souryal, who had previously performed Sager's knee surgery. With a dangerously low hemoglobin count, Sager had six blood transfusions over a 24-hour period before returning to Atlanta.